A staggering number of migrants and IDPs negatively impact the macroeconomy of Afghanistan. After Syria, Afghanistan is one of the world’s largest producers of refugees. According to the International Organization for Migration, in 2015, a staggering 12.96 percent of all citizens of Afghanistan lived outside their country of origin. The United Nations refugee agency, UNHCR, reports that there are approximately 2.6 million registered Afghan refugees that are dispersed throughout 70 countries, but the majority of these refugees are hosted by just two countries – Iran and Pakistan. After 2001, millions of Afghan refugees living outside the country, mainly in Pakistan and Iran, repatriated, hoping for better life, security, and employment. But 15 years later, in spite of the presence of the international community and U.S. forces, people remain disappointed with an unstable country, rising insecurity, and joblessness. A huge number of people are in search refuge in Europe and elsewhere. UNHCR estimates that Afghans account for up to 20 percent of the people who arrived by boat seeking asylum in Europe in 2015. What’s Behind the Upsurge in Migration? Afghanistan over the last decade experienced unreal economic growth. However, a significant portion of Afghanistan’s GDP and governmental revenue comes from foreign financial aid and U.S. military contracts. When the bulk of U.S and international forces withdrew from Afghanistan in 2014, the loss of money flowing into the economy from jobs and contracts connected to the U.S. military had an immediate effect. Economic growth plunged to 1.3 percent in 2014, down from an average of 6.9 percent from 2007 to 2012, according to the World Bank. At the same time, the unemployment rate jumped to 40 percent in 2014, a nearly fivefold increase from an average of 8.4 percent from 2006 to 2013. U.S. forces and international organizations were the main sources of employment for Afghanistan. The rise of a staggering unemployment rate after the withdrawal of U.S. forces calls into serious question whether the Afghan National Unity government will be able to provide jobs to the 15 million-strong working population in the country. The year 2014 was game-changer for Afghanistan. On one hand, international forces ended their combat mission and transferred the responsibility to Afghan-led forces. On the other hand, Afghanistan held presidential elections, which led to an agreement brokered by the United States between Dr. Ashraf Ghani and Dr. Abdullah Abdullah providing for the establishment of a National Unity Government (NUG) and creating the post of chief executive officer, held by Abdullah. Now Afghanistan is two years into the power-sharing arrangement between Afghan President Ashraf Ghani and Chief Executive Officer Abdullah Abdullah. The legitimacy of the NUG has been on a downslide. In fact, recent polls, word of mouth, and Afghan social media all indicate that the majority of the population is “not happy at all” with the Afghan National Unity Government. People claim that the government, which should concentrate on eliminating problems in the country, is rather wasting its energy on a power-sharing tussle. At the same time, after the U.S.-led forces transferred the combat mission to Afghan-led forces, the security situation has deteriorated in many parts of the country. Several districts have fallen over to the Taliban and civilian casualties have been increased. The upsurge in violence, a sluggish economy, political uncertainty, decades of disappointments, losing hopes in the international community, and staggering unemployment are some of the key reasons that encourage migration from Afghanistan. The number of migrants leaving Afghanistan is not entirely known, as most people are fleeing the country illegally. Human smugglers take the migrants out of the country in exchange for money, which makes it difficult to track the exact number. However, the number of migrants leaving the country each year reaches to tens of thousands. These migrants generally cross the Iran-Turkey border and from there take boats to reach the islands of Greece. Though there are no accurate figures for the number of migrants who leave the country each year, UNHCR data shows that more than 160,000 went to Europe in 2015. UNHCR estimates that 80,000 Afghan migrants applied for asylum in Europe in first six months of 2015, up from 24,154 who did so in the same period in 2014. Another report published by UN in April 2016, estimates that around 1,000 Afghans flee their homes each day, either seeking refugee abroad of becoming internally displaced persons (IDPs) within Afghanistan. According to the UN Office for the Coordination of Humanitarian Affairs (OCHA), approximately 118,000 Afghans fled their homes in the first four months of 2016. People smugglers charge each migrant between $7,000 and $10,000 for passage to Europe. The migrants also take money out of the country for their personal use upon arrival in Europe, often sent through hawala (a traditional monetary transfer system based on a huge network of money brokers). Due to the ambiguity surrounding illegal migration, it is impossible to pinpoint the amount of money that flow out of Afghanistan. But if it is calculated based on the known numbers of migrants arriving in Europe, the amount reaches into billions of dollars every year. This exodus of people leaving the country has put pressure on Afghanistan’s currency, already weakened by a sharp reduction in foreign funds. Afghan currency, which was trading 58.2 to a dollar in January 2015, has since depreciated by over 15 percent, and was trading at 67.49 in August 2016. Illegal migration is not the only problem affecting the currency. A staggering trade deficit also put pressure on the currency and negatively impacts the overall macroeconomy of Afghanistan. In 2015, Afghanistan had trade deficit of $7.4 billion, equal to 38.5 percent of the country’s GDP, World Bank data shows. This deficit is vigorously impacting the private sector, employment, and the currency. Afghanistan’s currency, the Afghani, has suffered from higher volatility over the last couple of years. In order to avoid “unreasonable” fluctuation, the Da Afghanistan Bank, Afghanistan’s central bank, auctions dollars to the tune of $60 to $70 million each week. In addition to financial concerns, Afghan migration also siphons away the country’s young and competent workforce. Those who are fleeing their homes include a large number of youths, the most dynamic, potentially productive strata of society. As per reports, most of the migrants that have reached to Europe are less than 30 years old. A huge proportion of this migration are the educated, who are in pursuit of a better life abroad. Growing violence means growing displacement: Afghanistan’s security deterioration not only forces people to leave the country but also displaces hundreds of thousands inside the country as well. There are, as of April 2016, a staggering 1.2 million internally displaced persons (IDPs) in Afghanistan with very little access to shelter, food, and education. This is a substantial increase compared to the end of 2012, when these numbers stood at almost 500,000. Most of these IPDs come from Kunduz, Helmand, Uruzgan, and Baghlan provinces of Afghanistan. 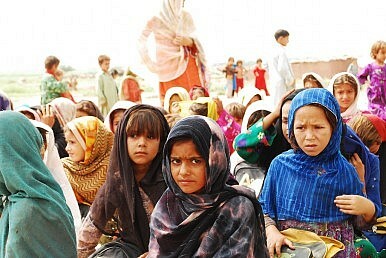 There are also many IDPs from Kandahar, Takhar, Faryab, and Laghman provinces. Security deterioration in the worst in remote areas of many provinces, where government control isn’t very effective. When areas fall to the Taliban, people to flee their homes and fight for their survival. The mass number of IDPs is hurting agriculture, one of the vital sectors of Afghanistan’s economy. The agricultural sector contributes 40 percent to Afghanistan’s GDP and 60 percent of Afghans rely on agriculture for their livelihood and family sustenance, USAID reported in January 2015. In 2014, the Afghan government endorsed a new National Policy on Internally Displaced Persons, raising the hopes of displaced people. But three years later, the situation for IDPs has become more dire and dreadful. Amnesty International reports that approximately 80 percent of IDPs require emergency humanitarian assistance. If the Afghan government and international society do not take immediate steps to improve the lives of both potential migrants and IDPs, the situation will worsen. In addition to being a real life catastrophe and humanitarian disaster, a rise in the number of migrants and internally displaced people would pose even more serious threats to the economy of the country as well. Laiq Zirack holds an MBA in Finance and International business from Jamia Millia Islamia University, New Delhi, India and a Bachelor’s of Business Administration from Swami Ramanand Teerth Marathwada (SRTM) University, Maharashtra, India. He is currently doing research on the prospects of Afghanistan’s economy. Climbing 16 places, the World Bank names Afghanistan as a top improver in its latest Doing Business report.